All paintings on my website and in studio are now $500 for a limited Time. Purchase online or visit my studio in Encinitas, Ca. The portraits for this project are made in a spontaneous way and are not based on the subjects' physical appearance, but would be considered more abstract. I call my painting style "Individual Realism", in that it is realism from my individual point of view; it is real for me. The point is not to draw the subject as they look in a picture but to draw from a collective inspiration I believe we are all connected to. And from this collective inspiration, we all have a unique way of expressing or grounding the creativity from the collective source. When I make portraits, my goal is to connect or find the inspiration that I feel is moving over head and is there for us all to connect with. Like the concept that the Universe is made up of music, I believe it's the same with visual art, all you need to do is look for the art and it will make its way onto your paper, canvas, wall, clay, etc...using your hands and body to create the art. This is what I'm trying to do with the portraits. I am trying to find a collective point of inspiration to create these portraits from. Most of the portraits I do are made by looking at a photo of someone, using this as a reference point. I try and find the image or picture to put with the person. This process is light and fun and my hope is that it can be interactive with the subject of the portrait, as well. One of my earlier blog posts is about the concept of Individual Realism as an art style. I wrote this blog post in an attempt to describe the kind of art I make. The media used for the portraits will most likely be graphite, oil pastel, and/or ink on paper. Basic overview of the process. Once the portrait has been created I will contact you with a link to see the artwork. I recently came to the realization that paintings don't need to be pretty. With this being said, I am ok if they are pretty because I'm not trying to make them ugly. Not having pretty pictures at the front of my mind has made the process of painting a much more enjoyable experience for me and has freed me to express myself in a new way. With the constraints of trying to make the pictures beautiful behind me, I feel as though I will be able to get closer to the message that wants to communicated with my art. This message has become more important than the beauty in my paintings. With the paintings being created with this new driving force, I have had more access to painting as myself...as I am, connecting with the subject matter in a more precise way. I am wanting to have a new name to explain these paintings. I can't call them abstract, because to me they are realism, they are my reality. Would it be possible to call them Abstract Realism or Individual Realism? I have never been able to tell someone what style my paintings are by only using the word "abstract" to describe them. I think from now on I will use the term Individual Realism. Definition of Individual Realism - ˌ/indəˈvij(o͞o)əl/ /ˈrē(ə)ˌlizəm/ : An artistic style in which the individual expresses what is real from their own, unique point of reference. I hope I never go back to trying to make pretty pictures; to trying to make other people happy, while disregarding myself and the Individual Realism each of us have inside. Option to utilize no parking sign to simulate player, street markings for boundaries / kicking zones., and curb for a variety of deflection angles. Skkeeckk is played with a minimum of four players and a maximum of 8 total players; four on a side. The object of the game is for the thrower to skip the disc into one of the marked zones without the opposing team catching the disc before it hits the ground. The defensive side, or the catching side, must stay within the catching zone they have chosen to occupy. No more than two players can share a catching zone. By catching the disc while still in the catching zone, the defensive team stops the thrower from earning points for their turn. Each throwing turn will last ten throws or three catches by the defense, which ever happens first. The game is over once each player has taken their turn as the thrower. Teams take turns at being the throwing side. Throws must cross the halfway line before skipping or that counts as a catch for the defensive side. Throwers may utilize a roll, but the roll must cross the halfway line inside of the lines of the court. The catchers must pick up the roll before it comes to a complete stop. Rolls that are not picked up are worth one point regardless of the zones it rolls through. The number of points awarded to the thrower is dependent upon which zone the disc first skips in. The basketball hoop, backboard, and pole are all hazards. If the thrower's disc touches this hazard at all, then that player's turn and points from that turn are forfeited. If the disc hits the hazard and is caught by a defensive player, then the game is over resulting in a victory by the defensive team. This action is called a "Razzle Dazzle". The side with the most points after each player has had a turn wins the match. Throwing zones may go back as far as desired. Catching Zones may go outwards from the court as far as desired. We recommend at least 6 feet if possible. 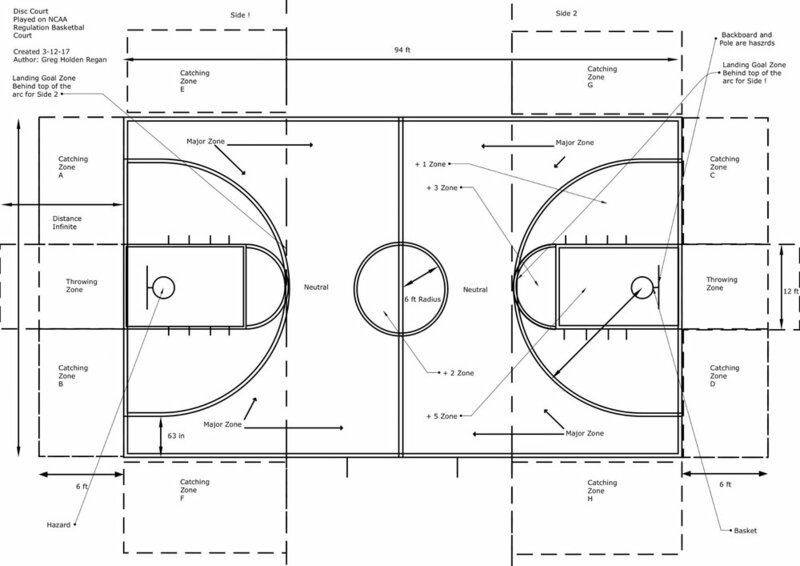 The other dimensions of the zones must follow the markings of the court. For instance, zones E,F,G, and H always reach from the top of the key to the base line of the court. Markings should be made with street chalk or tape. Skkeeckk should always be played with a freestyle disc. This is the first edition of "Skkeeckk" so please give us feedback to help the development of the game. THIS IS AN ART PIECE AND NOT INTENDED FOR ACTUAL GAME PLAY. The grass in this wonderful triangle shape is perfect, the shade makes it a great area for a hot day and the buildings give a feeling of a stadium. The game is designed for set piece practice for 2 - 5 players all playing for the same side. Foam ball could be utilized for play and would be gentle on the Giant Birds of Paradise in the square planters and would be window safe. The Marriott La Jolla shares the courtyard with this game area. First person view from where the Free Kick taker would be. Tumbleweeds and robots have become the focal point of my latest series again, along with botanical drawings of medicinal plants and herbs, as the third major component to the series. The new paintings highlight the Juxtaposition between the science of nature (represented by Botanical drawings) and the recent developments in robotics. The Tumbleweed aspect to the paintings once again is used as a symbol for a deserted city , ghost town or one might say collapse of culture and society. My latest inspiration in botanical drawings of medicinal plants, symbolize information that has been passed down from generation to generation and from one culture to another. The simplicity that all the answers could be right there in nature and the ancient knowledge of how to use and embrace it, is fascinating to me. The flip side of that is the creation of robots and machines to fix all of our problems, and to possibly do everything for us. The balance between technology and nature. This is the multi layered theme for my latest pieces and I hope to explore new ideas during the process of painting, to build on and create new stories. This is a nice article by Moray Mair about my previous series "Tumbleweeds, Robots, and Shopping Carts", on Mutant Space. 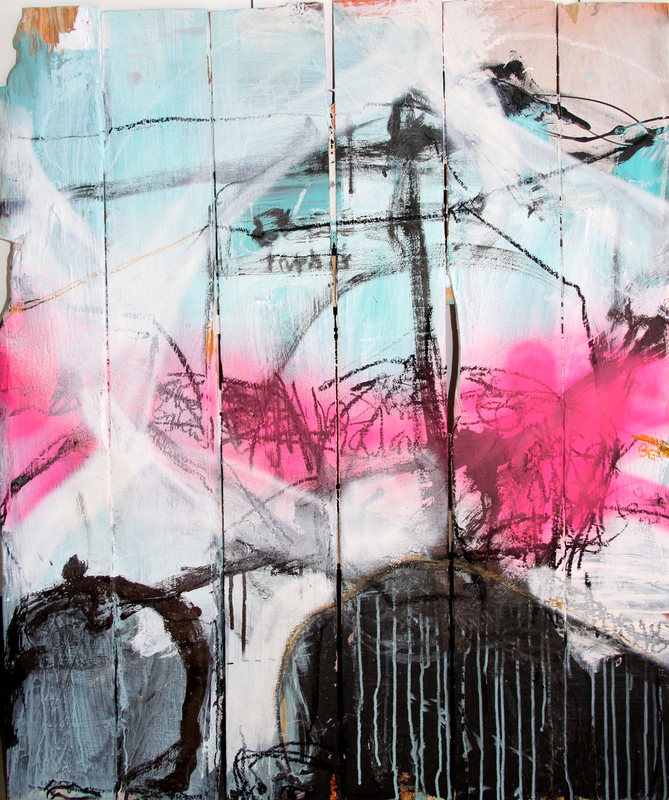 Working on wood gives the paintings a sculptural feeling and can add a whole new element to a 2D image. These painting were made from repurposed pieces of wood.